Ephemeris for Thursday, November 8th. The Sun will rise at 7:30. It’ll be up for 9 hours and 51 minutes, setting at 5:22. The Moon, 1 day past new, will set at 6:26 this evening. High in the south at 9 p.m. can be seen the Great Square of Pegasus. From the top left star of the square diverge two curved lines of stars that is Andromeda the chained princess. Just below and left of Andromeda is a slender triangle of stars, none particularly bright. It has a name you can easily see in the stars, Triangulum, the triangle. Early Christians saw it as the Mitre of Saint Peter or the Trinity. Another small constellation seen below Triangulum is the much better known constellation Aries the ram, a small hockey stick of a constellation, not that hard to spot. It is the first constellation of the Zodiac, where the Sun is supposed to enter on the first day of spring. Due to the wobble of the Earth’s axis over the millenia, that honor is now given to Pisces. Andromeda, Pegasus, Triangulum and Aries finder animation for 8 p.m. November 8, 2018. Created using Stellarium and GIMP. Click on the image to enlarge. Ephemeris for Election Day for some folks, Tuesday, November 7th. The Sun will rise at 7:28. It’ll be up for 9 hours and 54 minutes, setting at 5:23. The Moon, 3 days before last quarter, will rise at 8:49 this evening. We’ll have about an hour and a half of reasonably dark skies between 6:30 and nearly 9 p.m. – At 8 p.m. all the autumn constellations are visible. The Zodiacal constellations from Capricornus in the southwest through Aquarius, Pisces and Aries, all relatively faint to Taurus rising in the east northeast. Pegasus the flying horse is seen in the high south-southeast. It and the connected constellation of Andromeda the chained princess are seen above Aquarius through Aries. The bright star Fomalhaut holds a lonely vigil low in the south, High in the northeast is the W shaped constellation of Cassiopeia the queen, under which is Perseus, her son-in-law and hero down to the bright star Capella. 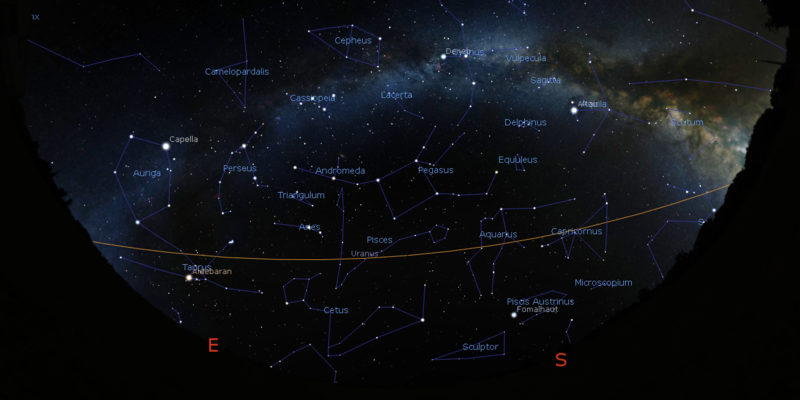 The sky at 8 p.m. November 7, 2017 showing the autumn constellations, centered on the southeastern sky. Click on the image to enlarge. The Milky Way has been brightened to show its passage through Perseus better. The red line is the ecliptic, the path of the Sun through the Zodiac. Created using Stellarium. Ephemeris for Thanksgiving Day, Thursday, November 24th. The Sun will rise at 7:52. It’ll be up for 9 hours and 14 minutes, setting at 5:06. The Moon, 3 days past last quarter, will rise at 3:54 tomorrow morning. From antiquity, the first constellation of the Zodiac has been Aries the ram. That’s the constellation the Sun entered on the first day of spring, or the vernal equinox. Well that was a couple of thousand years ago. Currently the vernal equinox point is in western Pisces. This is due to the wobbling of the Earth’s axis called precession. The spinning Earth like and top or gyroscope wobbles when force is applied to it. In this case the Sun and Moon. One wobble takes 26,000 years to complete. Anyway, Aries is a small constellation of four stars in a bent line, below the triangular constellation of Triangulum, which is itself below Andromeda. It’s a bit west or right of the Pleiades or Seven Sisters star cluster. Aries the ram animated finder chart for 9 p.m. November 24, 2016. Created using Stellarium and GIMP. The vernal equinox today, where the blue line, the celestial equator and the orange line, the ecliptic or path of the Sun cross. The Sun is where these lines cross on the first day of spring (March 20th around here). Note that the vernal equinox is now in western Pisces. Created using Stellarium. The vernal equinox back in AD 100, where the blue line, the celestial equator and the orange line, the ecliptic or path of the Sun cross. The Sun is where these lines cross on the first day of spring. Note that the vernal equinox was at the east edge of Pisces. Created using Stellarium. Ephemeris for Friday, November 9th. The sun will rise at 7:31. It’ll be up for 9 hours and 48 minutes, setting at 5:20. The moon, 3 days past last quarter, will rise at 3:29 tomorrow morning. High in the south at 9 p.m. can be seen the Great Square of Pegasus. From the top left star of the square diverge two curved lines of stars that is Andromeda the chained princess. Just below and left of Andromeda is a slender triangle of stars, none particularly bright. It has a name you can easily see in the stars, Triangulum, the triangle. It has been known from antiquity, and early Christians saw it as the Mitre of Saint Peter or the Trinity. Another small constellation seen below Triangulum is the much better known constellation Aries the ram. It is the first constellation of the Zodiac, where the sun used to to enter on the first day of spring. Aries is a small hockey stick constellation, not that hard to spot. 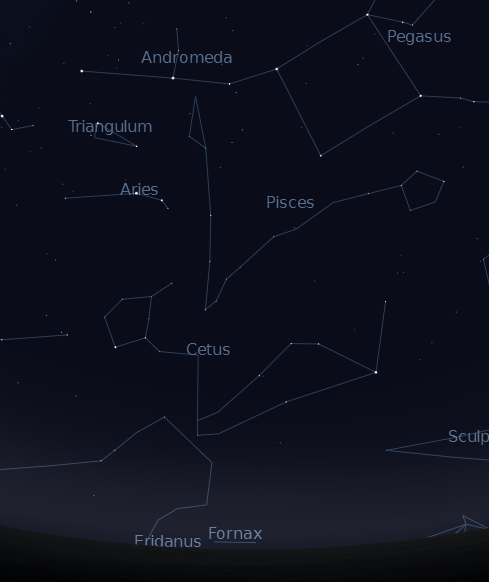 Cetus, Triangulum, Aries and surrounding constellations on November 8, 2012 at 9 p.m. Created using Stellarium.